As an alternative to manually coding the hierarchy attributes in a text editor, you can define them using the Synonym Editor. The controlling attributes are PROPERTY and REFERENCE in the Synonym Editor. The Synonym Editor opens to the Tree View tab, which shows a hierarchy of segments and columns on the left, with the attributes and values of the selected field on the right. Is the name of the column. Assigns an alternative name for a column, or the real column name for a DBMS synonym. 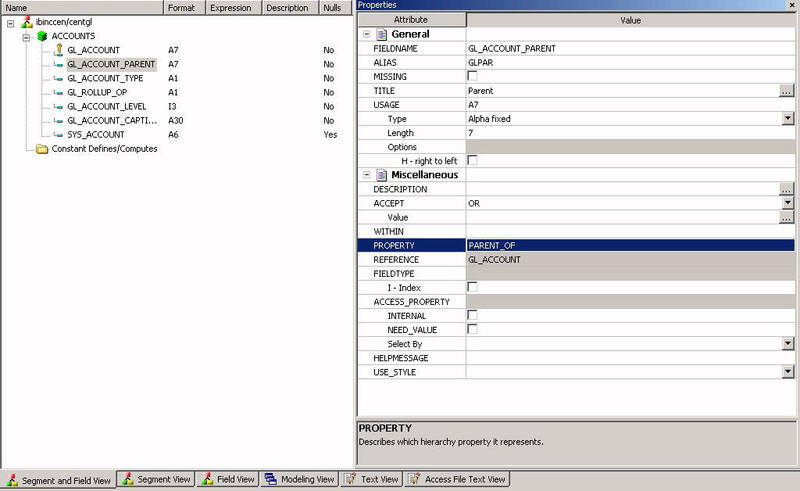 Controls how null data is handled, that is, if no transaction value is supplied. Supplies a title to replace the column name that is normally used in reports and enables you to specify multiple language titles for the column or field. Describes the data type and format for the column for usage or display. Note: Additional attributes, DEFCENT and YRTHRESH, are available if the Usage field is set to Date, Time, or DateTime (Timestamp) format. Use these attributes to enter the century and year threshold values for the column or field. Contains a description or comments about the column or field. Specifies criteria for validating data. Enables you to specify an acceptable value. Enables you to specify a range of acceptable value fields. Enables you to supply file and field names to instruct WebFOCUS where to search for a data source and for a list of acceptable values. You supply the field name of the data field for which the validation criteria are being assigned, the file name of the target FOCUS data source where the field can be found, and the field name of the target data field that contains the validation criteria. Note: Find is only available for FOCUS data sources and does not apply to OLAP-enabled Master Files. Note also that, in the Maintain environment, Find is not supported when developing a Master File. Contains the name of a field to be included in a dimension. Sets the property for the field. Enables you to reference another data source. Note: FIELDTYPE=R indicates a read-only column, which will not be updated by DataMigrator flows. This setting is useful for columns are that automatically assigned a value by the RDBMS, such as a Sybase or Microsoft SQL Server Identity or Timestamp column. Specifies access options for data in the column. Defines a column that does not appear in sample data or in the list of available columns. Restricts the field from showing in any of the Field Lists in the reporting tools. Defines a column that requires a value to access the data. Defines a column by value, range, or multivalues. Defines a column that describes the result of an authentication operation. Correct response values must be provided in the ACCEPT attribute (using the OR predicate if more than one value is acceptable). Defines a column that contains a response token to be passed as an input value to the operation to be executed. Appends a help message to a column. Note: The attributes available depend on the type of synonym.